What goes on inside a busy, noisy garage? 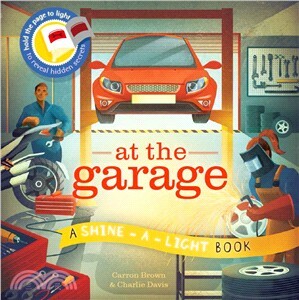 Children can find out in this beautifully illustrated Shine-a-Light title, which looks at a day in a garage, where engines are fixed, wheels are pumped up, and vehicles are repainted and mended so that everyone can go on their way. The unique design of the book allows children to discover a “hidden” image by holding the page up to a bright light, much like a lift-the-flap mechanism. For children aged 3 and up, this is a wonderful introduction to all sorts of vehicles and mechanical work.